Materials and Methods: A randomized clinical trial was conducted on 50 patients with second- and third-degree burn wounds. The baseline pain of the patients was assessed 30 min before they entered into the dressing room on the first and second days of intervention. The patients in the experimental group inhaled five drops of damask rose essence 40% in distilled water, while those in the control group inhaled five drops of distilled water as placebo. The pain intensity was assessed using Visual Analogue Scale at 15 and 30 min after the patients exited from the dressing room. Data were analyzed by SPSS (version 18) using descriptive and inferential statistics. Burns have many irreparable side issues for the patients and their families. In the human society, burns are accidents or disasters associated with injuries and wounds, which darken the beautiful images of life and reveal pain and suffering. Burn is traumatic, painful, and often debilitating, and is one of the most uncomfortable traumas for patients. Patients with severe burns describe the pain as the worst kind and excruciating. The pain of burns is often due to damaged skin or treatments created especially to change the dressings. Changing the dressing of the burnt area is one of the most effective and painful treatments, which is usually performed daily for the patients and causes an exacerbating pain for the patients during the day. It can also delay the unbearable pain of recovery and the wound healing. Appropriate pain control is considered the most important critical care in patients with burns. There are a variety of methods to relieve pain in patients with burns. The use of narcotic and non-narcotic drugs is the simplest and most common method of pain relief. Morphine, which is a commonly used analgesic opium for pain relief in these patients, has unpleasant side effects such as nausea and vomiting, dizziness, drowsiness, hypotension, constipation, respiratory depression, and increased tolerance to the drug. Most non-pharmacological methods or complementary therapies have fewer side effects and risks and can be used alone or in combination with other methods. Moreover, it is assumed that they can reduce the amount of consumed pain medications or drugs. In recent years, aroma therapy as a complementary method to reduce pain has been significantly used in most countries, compared to other methods. In addition, it can be used in medical programs alone or in combination with other methods, with fewer side effects and risks. Nurses can reduce anxiety and pain in some patients in certain situations using aromatherapy. Aromatic plant extracts and oils, aroma of flowers, and other natural fragrant materials were commonly used in ancient civilizations and even in small communities and primitive tribes to maintain health, strengthen and improve physical and mental abilities, and to dominate and influence people and forces of nature. In China, the use and application of medicinal plants and natural minerals has 1000 years of history. Fragrant materials (including herbal, mineral, and animal products such as musk and amber) had extensive uses for aromatherapy. Today, aromatherapy is one of the natural remedies used in holistic medicine in China. Thousands of years ago, aromatic plant oils were used in Egypt and India to treat various diseases. Today, aromatherapy has even been accepted by the United States' State Board of Nursing as part of holistic nursing. Inhalation aromatherapy using different essential oils can be effective in reducing pain, stress, anxiety, fatigue, and depression. However, controversy exists regarding the effects of different fragrances in different literatures as the exact mechanism of the effect of aromatherapy through these fragrances is unknown.,, In the standard method of inhalation aromatherapy, the desired aroma is chosen based on the purpose of the treatment and then inhaled by the patient by soaking a cloth with the desired essential oil or using an aroma diffuser. essence on pain after dressing wounds in patients with burns has been evaluated in this study. This was a randomized clinical trial registered with the code IRCT201302249759N4 at the Iran Clinical Trials Registry center. Convenience sampling was performed on 50 patients in two groups of experimental and control in the burn ward of Besat Therapeutic and Educational Center of Hamadan University of Medical Sciences, Hamadan, Iran, from May to October 2013. Inclusion criteria were: Being a burn patient of 18–65 years of age, able to speak and having vision, able to communicate effectively, having second-degree or second- and third-degree burn wounds, and lack of inhalation or electrical burns, burns on the face and the eyes, history of allergy or respiratory diseases, or deliberate burns. In contrast, the exclusion criteria included showing allergy to rose essence inhalation during the study and unwillingness to participate in or continue the study for any reason. The minimum sample size was calculated as 23 patients per group. It was calculated through the formula of determination of the number of samples in two independent groups, and by considering the significance level of α = 0.05, statistical power of 80%, and 95% confidence level, according to the study by Hadi and Hanid. Considering a 15% sample loss, 27 people were evaluated in each group, making a total of 54 patients. During the intervention, two subjects of the experimental group were excluded from the study due to discharge from the hospital and intolerance to aroma inhalation. In the control group also, two people were excluded from the study due to discharge from the hospital and lack of cooperation. The researcher obtained permission from the Ethics Committee of Hamadan University of Medical Sciences and registered the study in the Iran Registry of Clinical Trials center. Then, the researcher referred to Besat Therapeutic and Educational Center and obtained written informed consent forms from the patients who met the inclusion criteria. 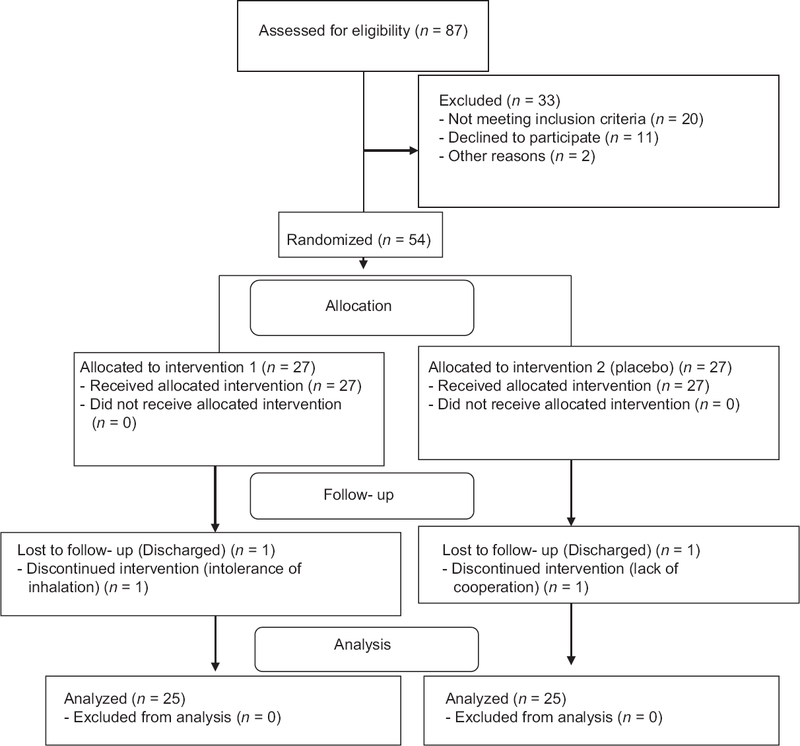 The patients were allocated to the intervention group and the control group using a coin according to trial profile [Figure 1]. Sampling was performed through gradual referral of the patients and evaluation of patients who met the inclusion criteria. It should be noted that all the patients received analgesic and sedative drugs, including routine injections of morphine sulfate 5 mg and diazepam 5 mg, before (1 h before wound dressing) and after wound dressing (immediately after wound dressing and returning to their room). The data collection tool was a questionnaire consisting of two parts. The first part of the questionnaire included questions on age, gender, the leading cause of burns, and depth and breadth of the burns. The second part of the questionnaire evaluated pain intensity using a visual analog scale (VAS). The VAS for pain intensity was based on the patients' subjective assessment. Its value was determined on a longitudinal 10 cm axis graded from 0 to 10, with 0 representing no pain, and 1–3 indicating mild pain, 4–6 showing moderate pain intensity, and 7–10 indicating severe pain. First, the questionnaire was read to the patients by the researcher and was completed based on self-report.,, Then, pain intensity was recorded 30 min before entering the wound dressing room. The intervention was performed for 2 days. For 20 min, patients in the intervention group inhaled five drops of 40% Damask Rose essence in distilled water. In the control group, the patients inhaled five drops of distilled water as placebo through the same procedure. Using a pipette, the essential oil of rose essence or distilled water was dropped on a 10 × 10 cm gauze which was attached to the collar of the patient's shirt, about 20 cm from their nose. This was performed by one of the unit nurses, as an assistant, without the researcher's knowledge (the researcher's nose was covered with an aromatic mask). After 20 min, the gauze was detached from the patient's shirt by the assistant and the patient was sent to the wound dressing room. Patients' pain intensity was measured by the researcher 15 and 30 min after they left the dressing room using the VAS. Inhalation aromatherapy was performed using rose essence on two consecutive days during the morning shift. The patients in the experimental group received aromatherapy in a separate room. Data were analyzed using SPSS software (version 18; SPSS Inc., Chicago, IL, USA) and descriptive and inferential statistics. Most of the patients were male (60% in the experimental group and 52% in the control group). Age of the patients was 33.2 ± 10.6 years in the experimental group and 34 ± 12.4 years in the control group. Most of the patients were employed (56% in the experimental group and 64% in the control group). In terms of income, most of the patients had a monthly income of less than 5,000,000 Rials (80% in the experimental group and 76% in the control group). The most common cause of burns was fire (84% in the experimental group and 96% in the control group). The mean duration of hospitalization was 22.5 ± 10.6 days in the experimental group and 22.6 ± 9.7 days in the control group. The mean extent of burns was 24.68% ± 8.6 in the experimental group and 23.2% ± 8.9 in the control group. There was no significant difference regarding demographic characteristics in both groups, and thus, they were homogeneous (P > 0.05) [Table 1]. Assessment of pain intensity before the first intervention in the aromatherapy group showed that 80% of patients experienced moderate pain (mean score = 5.4, SD = 1.2). This rate had decreased to 68% of patients at 15 min after the first intervention (mean score = 6.8, SD = 1.1), and 40% of patients at 30 min after the first intervention (mean score = 6.4, SD = 1.4). The intensity of pain in the control group showed that 96% of patients had experienced moderate pain before the first intervention (mean = 5.4, SD = 0.7). This rate was found to be 96% of patients experiencing severe pain at 15 min after the first intervention (mean = 7.6, SD = 0.7) and 92% experiencing severe pain at 30 min after the first intervention (mean = 7.3, SD = 0.6). Assessment of pain intensity before the second intervention in the aromatherapy group showed that 96% of patients had experienced moderate pain (mean = 5.4, SD = 1.1). This rate reduced to 72% (mean = 6.8, SD = 1) and 52% experiencing severe pain (mean = 6.5, SD = 1) at 15 min and 30 min after the second intervention, respectively. While the intensity of pain in the control group showed that 100% of the patients experienced moderate pain before the second intervention (mean = 5.4, SD = 0.6). This rate was found to be 96% of patients experiencing severe pain at 15 min after the second intervention (mean = 7.6, SD = 0.7) and 96% experiencing severe pain at 30 min after the second intervention (mean = 7.4, SD = 0. 6) [Table 2]. Comparison of the mean pain intensity of patients with burns in the experimental and control groups in the first intervention showed that there was a statistically significant difference between the mean pain scores at 15 min (0.84) (P = 0.010) and 30 min (0.92) (P = 0.001) after the intervention. Furthermore, comparison of the mean pain intensity of patients with burns in the experimental and control groups in the second intervention showed that there was a statistically significant difference between the mean pain scores at 15 min (0.72) (P = 0.001) and 30 min (0.88) (P = 0.001) after the intervention. In addition, the mean pain intensity of patients with burns in the experimental and control groups before and after the first and second interventions showed that pain of patients in the experimental group had lower increase compared to the control group after wound dressing (P = 0.010) [Table 3]. Comparison of the severity of pain between the two groups of aromatherapy and control before and after the time of repeated measurements using repeated measures analysis of variance (ANOVA) showed a significant difference between the groups (F = 5.2, P = 0.027). Moreover, mean pain intensity during the three time periods of 30 min before aromatherapy, 15 min after aromatherapy, and 30 min after aromatherapy in the two groups had a statistically significant difference (F = 256, P < 0.001). In addition, the changing trend showed that the average amount of increase in pain intensity during 2 days of intervention after wound dressing was lower in patients in the experimental group than in the control group [Figure 2] and [Figure 3]. In this study, most patients (52%) in the experimental and control (60%) groups were male. The mean age of patients in this study was 30 years. The increased incidence of burns in young males might be due to their professions that involved greater contact with caustic substances and fire. The majority of patients had education lower than diploma (90%) and was employed (60%) and married (78%), which shows the effect of education, job, and family troubles on burn accidents. The most common cause of burns among adults in this study was flame (96%). The mean duration of hospitalization in this study was 22.66 days. The high mean of hospitalization duration in this study compared to other studies, in addition to factors such as quality of care and treatment, extent and depth of burns, and age might be due to factors such as the waiting list for surgery and not being able to pay the high healthcare costs. The mean extent of burns in this study was 24.04%. The depth of the burns in this study was mostly second degree and third degree (50%). The extent and depth of burns depend on how the burns occurred, their cause, gender, duration of exposure to caustic substances, first aid, and cooling the burnt area. These factors have been reported differently at different centers for burns. The findings indicated a significant decrease in pain level in the experimental group compared to the control group. The mean distribution of pain scores before and after the intervention in the experimental and control groups was evaluated using independent t-test. This showed a significant difference at 15 and 30 min after the intervention on the first and second days of intervention. The statistical tests showed significant differences between the severity of pain in the two groups at 15 min (P = 0.010) and 30 min after treatment on the first and second days (P = 0.010). Therefore, inhalation aromatherapy using rose essence has an effect on pain reduction in patients with burns after wound dressing. Pain caused by burns is a unique and complex challenge for all healthcare workers and patients. In spite of the advances in the treatment of burn wounds, the pain due to burns is generally inadequately treated. Uncontrolled pain due to burns is associated with depression, chronic pain, and the desire to commit suicide after getting discharged. A large number of patients complained of pain before the interventions and revealed that the daily care procedures such as removal of dressings, cleaning, debridement, and dressing burns were the main reasons for their pain. Thus, an increase in pain after dressing was not unexpected. Nevertheless, as the results of this study show, this increase in pain was lower in the experimental group compared to the control group. This difference was statistically significant. Considering that untreated acute pain has serious physiological and psychological consequences, many studies have been conducted in this regard. Han et al. studied the effect of aromatherapy with essential oils of lavender, rose, and sage on pain of dysmenorrhea in women and found that the mean pain severity scores in the aromatherapy group were significantly lower than in the group without intervention. 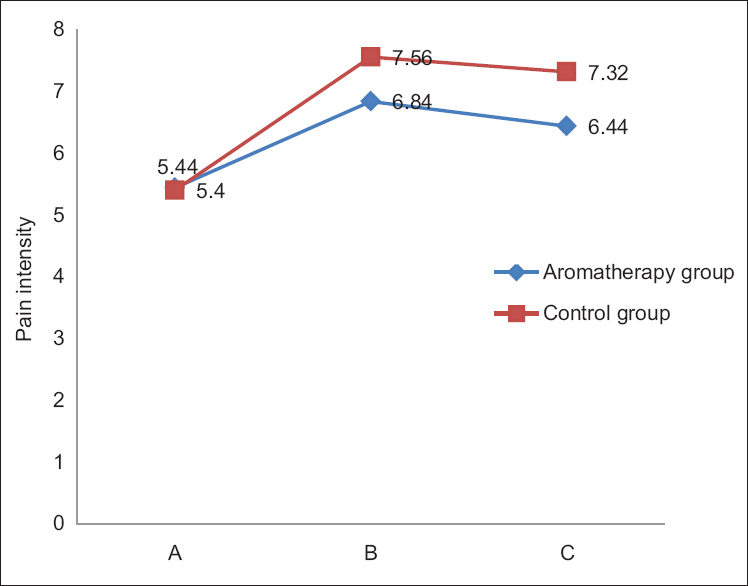 This finding was consistent with the present study results regarding further reduction in pain intensity score of the aromatherapy group compared to the control group. The results of the study by Kim et al. showed that pain intensity after aromatherapy had no significant difference in the control and experimental groups. However, patients in the aromatherapy group had greater satisfaction regarding pain control than the patients in the control group. These results were not consistent with the present study results, and perhaps, the reason of pain in dysmenorrhea is more related to internal factors such as hormones and so on. The reason for the significance of the results may be memory, which is a factor associated with the impact of scents. Scents trigger memories and enable the person to review the details of the events and emotions. The scent of R. damascena caused lack of focus on pain and prevented an increase in pain perception of the patients in the experimental group, as reported by Seifi et al. that positive or negative memories can influence the intensity of perceived pain. According to the study, aromatherapy, using R. damascena essential oils, is a moderately effective nursing intervention for pain relief from burns. In this study, age, lack of mental disorders, and lack of addiction to drugs and alcohol were the controlled variables or limitations considered by the researcher and were controlled through uniformity and homogeneity. It is recommended that a more comprehensive review of the effects of aromatherapy using R. damascena and other essential oils and other complementary medicinal techniques be performed on stress, anxiety, and pain. Non-pharmacological methods such as inhalation aromatherapy using R. damascena can be used in combination with analgesics to relieve pain in patients after burns, in order to reduce the consumption of narcotics and non-narcotic drugs and their several side effects and patients' various responses to analgesics. This article was a part of the research project of Master's thesis in Medical-Surgical Nursing, registered at Hamadan University of Medical Sciences (No. 287/9/35/16/D/P). This study has been registered at the Iran Registry of Clinical Trials (IRCT201302249759N4). It was approved by the Ethics Committee of Hamadan University of Medical Sciences as well. Our sincere appreciation goes to all patients participating in this study and the respected officials and nurses at Besat Therapeutic and Educational Center. Pasalar M, Mohammadi AA, Rajaeefard AR, Neghab M, Tolidie HR, Mehrabani D. Epidemiology of burns during pregnancy in southern Iran: Effect on maternal and fetal outcomes. World Appl Sci J 2013;28:153-8. Carrougher GJ, Ptacek JT, Honari S, Schmidt AE, Tininenko JR, Gibran NS, et al. Self-reports of anxiety in burn-injured hospitalized adults during routine wound care. J Burn Care Res 2006;27:676-81. Tan X, Yowler CJ, Super DM, Fratianee RB. The efficacy of music therapy protocols for decreasing pain, anxiety, and muscle tension levels during burn dressing changes: A prospective randomized crossover trial. J Burn Care Res 2010;31:590-7. Koltzenburg M, Tracey I, Turk D. Wall and Melzack's Textbook of Pain. 6th ed. London: Elsevier Limited, Oxford; 2013. p. 1184. Fayazi S, Shariati A, Momeni M, Latifi M. The efficacy of benson's relaxation technique on postoperative pain in coronary artery bypasses graft. Sci Med J 2010;8:479-89. Fayazi S, Babashahi M, Rezaei M. The effect of inhalation aromatherapy on anxiety level of patients in preoperative period. Iran J Nurs Midwifery Res 2011;16:278-83.
de Jong AE, Middelkoop E, Faber AW, Van Loey NE. Non-pharmacological nursing interventions for procedural pain relief in adults with burns: A systematic literature review. Burns 2007;33:811-27. Bharkatiya M, Nema R, Rathor K, Panc Hawats. Aromatherapy: Short review. Int J Green Pharm 2008;2:13-6. Kyle G. Evaluating the effectiveness of aromatherapy in reducing levels of anxiety in palliative care patients: Results of a pilot study. Complement Ther Clin Pract 2006;12:148-55. Soden K, Vincent K, Craske S, Lucas C, Ashley S. A randomized trial of Aromatherapy massage in a hospice setting. Palliat Med 2004;18:87-92. Kim S, Kim HJ, Yeo JS, Hong SJ, Lee JM, Jeon Y. The effect of lavender oil on stress, bispectral index values and needle insertion pain in volunteer. J Altern Complement Med 2011;17:823-6. Conrad P, Adams C. The effects of clinical aromatherapy for anxiety and depression in the high risk postpartum woman-A pilot study. Complement Ther Clin Pract 2012;18:164-8. Kutlu AK, Yılmaz E, Çeçen D. Effects of aroma inhalation on examination anxiety. Teach Learn Nurs 2008;3:125-30. 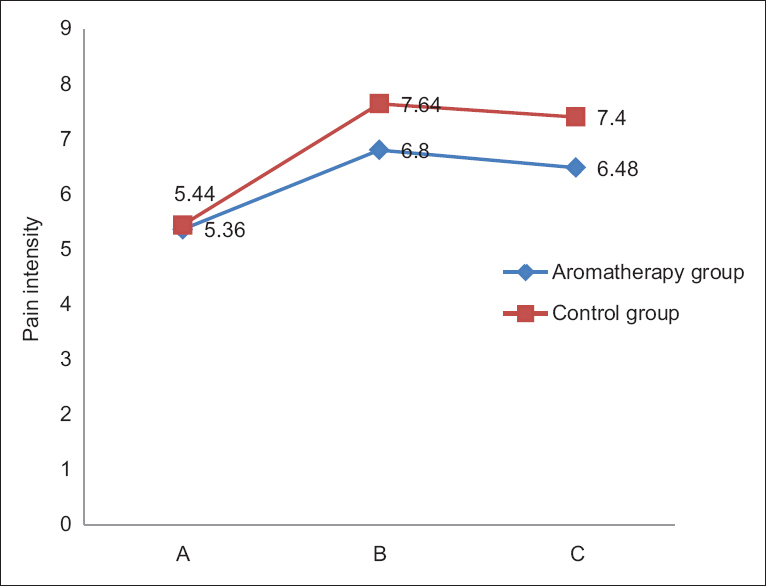 Bikmoradi A, Seifi Z, Poorolajal J, Araghchian M, Safiaryan R, Oshvandi K. Effect of inhalation aromatherapy with lavender essential oil on stress and vital signs in patients undergoing coronary artery bypass surgery: A single-blinded randomized clinical trial. Complement Ther Med 2015;23:331-8. O'Flaherty LA, van Dijk M, Albertyn R, Millar A, Rode H. Aromatherapy massage seems to enhance relaxation in children with burns: An observational pilot study. Burn 2012;38:840-5. Matsukawa M, Imada M, Murakami T, Aizawa S, Sato T. Rose odor can innately counteract predator odor. Brain Res 2011;1381:117-23. Hajibagheri A, Babaii A, Adib-Hajbaghery M. Effect of rosa damascene aromatherapy on sleep quality in cardiac patients: A randomized controlled trial. Complement Ther Clin Pract 2014;20:159-63. Boskabady MH, Shafei MN, Saberi Z, Amini S. Pharmacological effects of rosa damascene. Iran J Basic Sci 2011;14:295-307. Hanafiah Z, Potparic O, Fernandez T. Addressing pain in burn injury. Curr Anaesth Crit Care 2008;19:287-92. Kim YJ, Lee MS, Yang YS, Hur MH. Self-aromatherapy massage of the abdomen for the reduction of menstrual pain and anxiety during menstruation in nurses: A placebo-controlled clinical trial. Eur J Integr Med 2011;3:e165-8. Hadi N, Hanid AA. Lavender essence for post-cesarean pain. Pak J Biol Sci 2011;14:664-7. Johnson C. Measuring pain. Visual analog scale versus numeric pain scale: What is the difference? J Chiropr Med 2005;4:43-4. Hanifi N, Bahraminejad N, Abadi T, Ahmadi F, Khani M, Taran L. The effect of orientation program on stress, anxiety and depression of patients undergoing coronary angiography. Nurs Res 2012;7:258-61. Shafiei Z, Babaee S, Nazari A. The Effectiveness of massage therapy on depression, anxiety and stress of patients after coronary artery bypass graft surgery. Iranian Journal of Surgery2013;21;1:23-33. Richardson P, Mustard L. The management of pain in the burns unit. Burns 2009;35:921-36. Mollahadi M, Tayyebi A, Ebadi A, Daneshmandi M. Comparison between anxiety, depression and stress in hemodialysis and kidney transplantation patients. Iran J Crit Care Nurs 2009;2:153-6. Han SH, Hur MH, Buckle J, Choi J, Lee MS. Effect of aromatherapy on symptoms of dysmenorrhea in college students: A randomized placebo-controlled clinical trial. J Altern Complement Med e 2006;12:535-41. Kim JT, Wajda M, Cuff G, Serota D, Schlame M, Axelrod DM, et al. Evaluation of aromatherapy in treating postoperative pain: Pilot study. Pain Pract 2006;6:273-7. Seifi Z, Beikmoradi A, Oshvandi K, Poorolajal J, Araghchian M, Safiaryan R. The effect of lavender essential oil on anxiety level in patients undergoing coronary artery bypass graft surgery: A double-blinded randomized clinical trial. Iran J Nurs Midwifery Res 2014;19:574-80.